It's the 21st century, and global warming is here to stay, so forget the way your country used to look. And get used to the free market, too – the companies possess all the best hardware, and they're calling the shots now. In a world like this, a man open to any offers can make out just fine. A man like Greg Mandel for instance, who's psi-boosted, wired into the latest sensory equipment, carrying state-of-the-art weaponry – and late of the English Army's Mindstar Battalion. As the cartels battle for control of a revolutionary new power source, and corporate greed outstrips national security, tension is mounting to boiling point – and Greg Mandel is about to face the ultimate test. 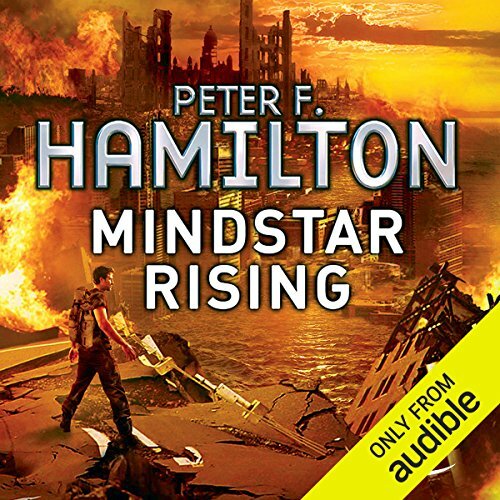 Relative to Hamilton's more recent work (the Commonwealth Saga), Mindstar Rising is clearly not in the same league. That said, this 1st book of the Greg Mandel trilogy demonstrates the talent that has emerged as one of preeminent contemporary scifi authors. Mindstar is simply not as ambitious, nor as sweeping in scope as his later work, but the story is masterfully done and a thoroughly enjoyable listen. We are presented with the limits of a near future tale (still near future due to the identifiability with the characters' daily routines), set late in the 21st century. Both environmental (in the form of global warming) and political (in the form of economic upheaval leading to vicious UK socialism) changes have occurred. Greg Mandel is a former UK soldier, discharged by the new, anti-military government. The Mindstar unit was a special ops group that received early experimental bioimplants. Mandel has an "esp" sense to detect mental states in others close by. He does not "read" minds, but can sense emotional reactions. Greg is hired by a wealthy, elderly businessman and his granddaughter to track down what is thought to be sabotage within their manufacturing facilities (some of which are space based). What appears as straightforward corporate espionage and hardball takeover tactics gradually evolves into a life or death struggle with national political ramifications. For the major scifi elements, biology and cyber dominate along the lines of a William Gibson / Richard K Morgan love child. The characters are wonderfully developed with vile villains and endearing supporting characters. The narrator performs an admirable rendition for the range of characters. Obviously an "early" Hamilton. It reads smoothly and the narrator is pleasant, but he's still learning to develop his plots. 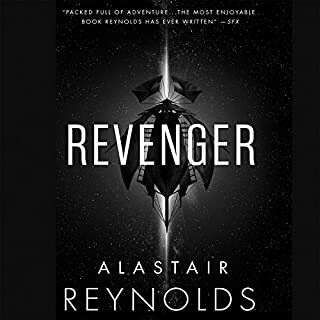 This isn't the epic thriller you will come to love in the star flyer wars in the Pandora's Star/Judas Unchained series or the Void Series but you'll grow to like the characters and there's pretty good action mixed in to keep action junkies like me happy. 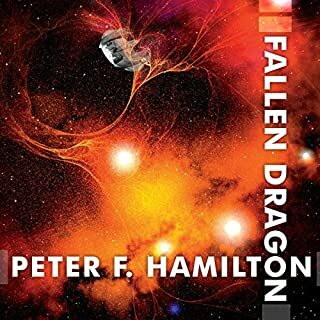 If you like his style in his later books read this series and if you give it time it will grow on you, if you're not sure or a new reader of Peter F Hamilton, his later books are his best and these are simply good so whatever you do don't put these down and leave Hamilton until you've tasted the good stuff. What did you love best about Mindstar Rising? New sci fi approach, unconventional and dysotopian future world. Mixed genre of scifi and detective without one being more dominant. The psi abilities opened quite a few possibilities strands. It was quite coherent and the narrative stayed true throughout. Despite being a triology, it could stand on itself as a single sci fi / detective novel. His standard voice can be a bit grating, but overall was OK.
Psi mutant detective vs greed in a dysotopian world. It's a good book, once you get past initial scene setting. The last 3rd of the book was stretched - but that's a minor fault, if at all. I remember reading an interview with Larry Niven where he explained that detective science fiction is hard to write due to how easy deus ex machina via technology is. When you consider this, Peter F. Hamilton does an incredible job. The main character has a gland that gives him a form of ESP, though it is more of an empathy enhancer that gives him insight into the emotional state of a person but also heightens his intuition. Another character can see the future. So the exploits are obvious but Hamilton does an incredible job of keeping these abilities realistic with clear boundaries so the story is not destroyed by technology. For instance, the character who can see into the future does not see future events but future possibilities. She determines likely outcomes by seeing how many versions of the future converge on a particular event. This detective story focuses on industrial espionage and politics. There are some attempted murders with the most interesting attempt being on a computer that is essentially a downloaded human mind. The mystery, however, is a bit on the obvious side with me figuring out who the mole was long before the hero. Still, the future that is portrayed is very interesting and kind of scary when you look at the modern state of the world. Some people have described it as a dystopian future, but it is more of the beginning of a rebirth of the world after a dystopian age. 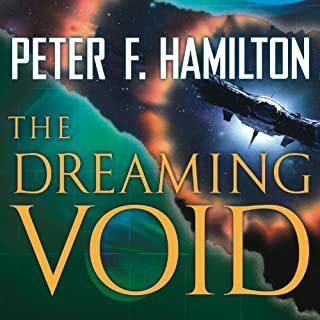 If you liked the other Peter F. Hamilton books available then you will probably enjoy this one, but I would recommend listening to Commonwealth series (Pandora's Star, Judas Unchained, and the Void trilogy) first if you have not already listened to them. Peter F. Hamilton has more sci-fi imagination in his little typing finger than most authors have in their whole body! At times, it was all I could do to keep up with all the ideas and jargon he was throwing at me. Listening to the audio version makes it even more difficult to digest everything, so you'd better not try to listen to this book while operating heavy machinery. 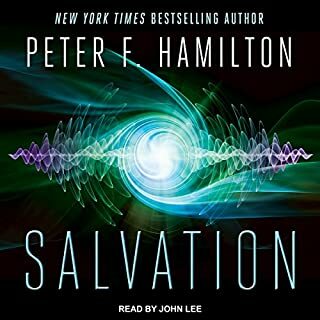 Just listen to the first chapter and you will know that Mr. Hamilton is a certified sci-fi genius. He brings along some of the "inventions" from his previous books, but just enough to make you recognize his fingerprint. In this book, the scope is more narrowly contained to a single planet, which must have been like trying to keep Robin Williams on a single topic, but he does cover much of the planet (and the space above it, and below the surface of the water). This book pulls a few pages from The Windup Girl and Daemon, very smart. I can't wait for Book 2! A lot of time was wasted listening to endless descriptions of the surroundings into minute detail. I found myself zoning out from boredom, and had to rewind a few times as something important was missed. The stereo types were just too much. It was like reading a short story from a womans magazine. The rich beautiful is evil to the bone, the hero is a rightous guy and the game between them and their alles is predictable. I like a book where there are grays and surprises. None here. Would you be willing to try another book from Peter F. Hamilton? Why or why not? Perhaps. This is my first, and even though the story was easy to see through, it was still entertaining. The narrator was easy to understand. Sometimes when they have to portray a tough guy, he ends up sounding dumb as a door. I was left with that impression of the hero, even though he was quite smart. Was Mindstar Rising worth the listening time? I actually do not know. I would have listened to another more interesting story, but I still wanted to know how it ended. Would you listen to Mindstar Rising again? Why? I don't think so. The book is great, and the narration is excellent, but it isn't the sort of book that makes you THINK. Several of the authors' other stories are worth listening to several times, because they're complex and layered, and you always hear something a little different the second and third times you listen. This book isn't like that; it's satisfying as it is, but not complex enough to require a second listen. The fact that this book was released in 1993, right around the time that cell phones first hit the retail market, and yet the technology in it feels very "now". What does Toby Longworth bring to the story that you wouldn’t experience if you just read the book? Being that I'm not British, I'm not sure how authentic any of his accents are, but to my Canadian ear, they SOUND perfect, and every character is distinguishable from the others. All three of these stories are great, fast moving stories set in a world it is easy to believe in that still has plenty of surprises. Peter Hamilton is a master and it is great to have these three stories online now also. Highly recommended, although I think the first one was the best one. Absolutely. 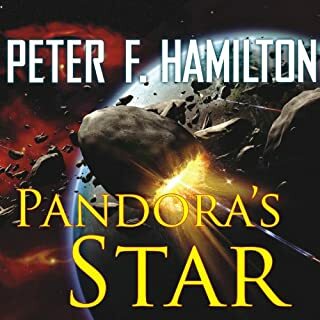 I've been a fan of Peter F. Hamilton after going through his later works, and wanted more of his style - which is deceptively subtle, fast paced, and very engaging. Greg Mandell - He's a few years removed from military service and while still retaining his edge, more human. He appreciates the way of soldiers without being reduced to a simpleton military mindset. Adding psi empathic abilities to a solider makes for really good reading. I had to look this book up again just to make sure Toby Longworth was the only narrator - he's simply fantastic! He gives each character not only a distinct voice, but also personality. He is smashing! One of the best readers I've ever come-across. The key to my enjoying this PFH novel was to disassociate everything I’d previously read by the author in the Commonwealth Saga series. Here there are no alien threats or exotic stellar locations to explore. This story takes place in a far less optimistic, multi-point dystopian future where twin environmental and political disasters have stratified the class differences in society. The gritty tone is exemplified in the protagonist, psychic freelance mercenary Greg Mandel, a two-dimensional tough guy who uses the phrase “no messing” to end far too many sentences. The strength of this story is in the unraveling of a corporate mystery with turns and twists which explore most corners of Hamilton’s dark future. It’s a bit like watching a police procedural with psychic cops and some minor near-future SF tech peppered in. 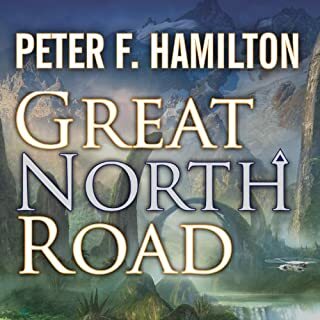 It compares quite similarly to Hamilton’s other, separate, story- Great Northern Road- which features a similar investigation but has the added element of off world alien settings and more examples of action scenes. Much of the crime and conspiracy here are strictly white-collar, and it was hard to identify with the Mandel character or even sympathize with him during the only truly high-stakes, dangerous moments he endures in the climactic ten percent of the story, no messing. Given was written in the early 90s, the setting is eerily apt and poignant right now. Near future sci-fi, elements of cyberpunk, corporate scandal and detective story to boot and Toby Longworth's performance (because that's what it is) is first class. Highly recommended! I listen to audio books on long car journeys - if they are any good then the journey appears to take no time at all. Listening to this, the first of the Mindstar trilogy, caused me to enter a time-space vortex in which I was transported nearly 200 K without any sensation of movement, time or other reality. My esper sense clearly helped me to drive while the gland secretions enabled me to do so safely - either that or the other road users just gave me a wide berth. I cannot believe this was narrated by one person; awesome is the only real reaction. I particularly liked the evocation of one of the evil characters who sounded remarkably like a former UK prime minister!!! I think you either love sci-fi or just don't get it. If you love it - you will definitely get this. My feeling about what makes a really good audio book (or any book come to that) is - are the characters believable, do you care about the characters and what is/will happen to them, is the plot immersive and does it make you want to guess? I would answer yes to all those points and just say that the creation of England post global-warming is intelligent and very well articulated. I loved the idea of Peterborough becoming a major sea port and a kool place to live - now that really is science fantasy. This is an excellent read if you are into "not too distant future" sci fi. Present day politics, companies etc, but with twists. The story doesn't hold you by the hand, from the get go it used terms (mimox crystals etc) I wasn't sure on, I thought had I missed something from another one of Peter Hamiltons books. But things are revealed bit by bit and I have to say, I rather liked it like that. Not explaining everything as soon as it appears, the story lets you piece this world together yourself, but does expand on it later. A great story, excellent world and Greg Mandel is now number 3 in my list of top main characters, after Jack Reacher (Lee Child) and John Clarke (Tom Clancy). I am definitely getting the second and third parts of the trilogy, and will probably get the rest of Peter Hamiltons books, on the back of this great story. Hamilton is always good value and the narration from Toby Longworth was top-notch and has prompted me to look for other books he has narrated. Mindstar Rising is narrated excellently by Toby Longworth and sets the scene for a genuinely excellent sci-fi trilogy. I originally only got this as it was on special offer but I wouldn't have begrudged paying full price at all. The characters are very well detailed and the future Earth that they inhabit is given its own unique, thoroughly described reality. The real key as to whether to start a series though is whether it delivers consistently and having read the other volumes in the trilogy it does. If you like this one I believe you'll like the rest. After listening to the void trilogy I was looking for something else from Peter Hamilton but these didn't appeal to me, I think the near future bit and name put me off. However when I decided to give this a go I was hooked. I still prefer the distant future novels but this was very enjoyable and have since purchased the remaining 2 books. Would definitely recommend no messing. Would you consider the audio edition of Mindstar Rising to be better than the print version? Greg the main character, his history and traits make him a compelling listen. Umm very similar question to the above, Greg. I cant really think of one. This sirs and ladys is a good book well performed and well read. I really enjoyed it and would highly recommend it. A quick summary its about a century in the future. glodal warming has happened forcing a population move in England . as this happened an extreme socialist nearly communist party comes into power and ran the country into the ground. using ever more extreme violence to maintain power. in this unstable country ex army veteran is unleashed to solve a corporate sabotage issue. An early Peter Hamilton novel which lacks his later polish but enjoyable never the less. Toby Longworth's excellent narration was worth an extra star. A great read. The author has created a rich believable world, set in the not too distand future. By the end the characters feel like friends that you want to see again. I must admit I like the shorter (in comparison) books by Mr Hamilton. This is great. I bought the paperback years ago and read it several times. The author has done a great projection of what if/climate change/ultra right-wing governments/military scenarios. Very believable. Greg Mandel is an engaging character and a very believable British (ex) army guy. The narrator is also first class. Wish there were more than three in the series! i was gripped right from chapter one! impossible to pull myself away from such an action packed story! he does like to describe what the female characters in the story look like and wear in great detail...this got annoying after some time. I only got about 10 minutes into this book. So take my stars with a lot of salt. The problem, the gasping of breath from the narrator. I thought the whole experience was entertaining. I am not normally a sci-fi reader but this book was still fun to listen to. I would say it is for mature audiences.